The Trump administration will place new pressure on Pakistan to stop providing safe haven to terrorists as part of a broader Afghanistan strategy update announced Monday night. President Donald Trump, who delivered a long-awaited address outlining a new plan for the 16-year war, now the nation's longest, suggested the United States will slash the billions of dollars in aid provided to Pakistan annually if it fails to take action against terrorist groups, namely, the Taliban. 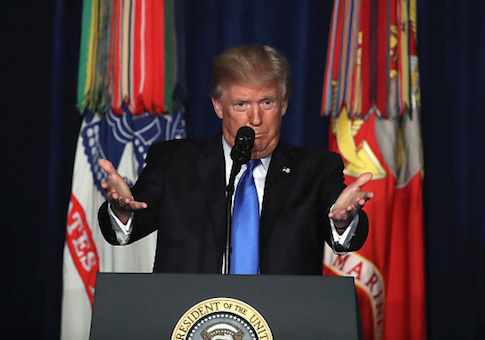 "Pakistan has much to gain from partnering with our effort in Afghanistan," Trump said. "It has much to lose by continuing to harbor criminals and terrorists." Pakistan and bordering Afghanistan are home to the highest concentration of terrorist groups in the world, with more than 20 U.S.-designated foreign terrorist organizations residing in the two countries. The Pakistani government is notorious for harboring terrorist groups, including top Taliban leaders. Trump also said the United States will seek greater help from India, Pakistan's neighbor to the south, in the areas of economic assistance and development in Afghanistan. The announcement follows a months-long policy review encompassing top U.S. military commanders and political advisers and aims to change the tide of the war that has been locked in a stalemate for over half a year. Trump in his Monday speech said he will not detail troop levels, nor will he issue an end date for withdrawal. He said the war will be guided by conditions rather than timelines, but did not expand on how the United States would achieve victory. Trump spent much of his speech reassuring the American public that U.S. military involvement will have a clear end goal, though he did not detail what that would look like. "Nearly 16 years after September 11 attacks, after the extraordinary sacrifice of blood and treasure, the American people are weary of war without victory," he said. "I share the American people's frustration." "My original instinct was to pull out, and historically I like following my instincts. But all my life, I have heard that decisions are much different when you sit behind the desk in the oval office. In other words, when you are president of the United States. So I studied Afghanistan in great detail and from every conceivable angle." Defense Secretary Jim Mattis received the authority in June to deploy up to 3,900 troops to the region, but has held off on a decision until the administration agreed on a wider strategy. Though some questioned entrenching the United States deeper into the war, few in the administration have advocated a drawdown, hoping to avoid what many consider missteps by the Obama administration that allowed the Taliban to resurge. Trump too has been weary of ramping up U.S. involvement, calling for a complete withdrawal prior to launching his presidential campaign. The United States currently maintains an estimated 8,400 troops in Afghanistan, with most being assigned to the 13,000-strong NATO force tasked with training and advising Afghan forces. Some 2,000 American soldiers carry out counterterrorism operations alongside Afghan troops to combat terrorist groups, including the Taliban and Islamic State. The top U.S. commander in Afghanistan, Army Gen. John Nicholson, warned in a hearing before Congress earlier this year that the war was at a "stalemate." The sentiment was echoed again in June when Mattis told Congress the United States is "not winning" the fight against the Taliban. Pentagon officials have argued that deploying additional troops would enable American forces to reclaim territory from the Taliban and reverse gains made by ISIS. Chris Harmer, a senior Naval analyst with the Middle East Security Project at the Institute for the Study of War, said while Trump's announcement was a step in the right direction, he hopes to see an uptick in troop levels by nearly 8,000. "The U.S. military has some special operations capabilities that no other military in the world has, and unless we bring those capabilities to bear, the Taliban, al Qaeda, and ISIS are all going to have reestablished safe havens in Afghanistan—more so than they already do," Harmer said. This entry was posted in National Security and tagged Afghanistan, Donald Trump, Pakistan. Bookmark the permalink.